The Society for Marketing Professional Services (SMPS) is accepting entries for its 40th annual Marketing Communications Awards (MCA) competition. 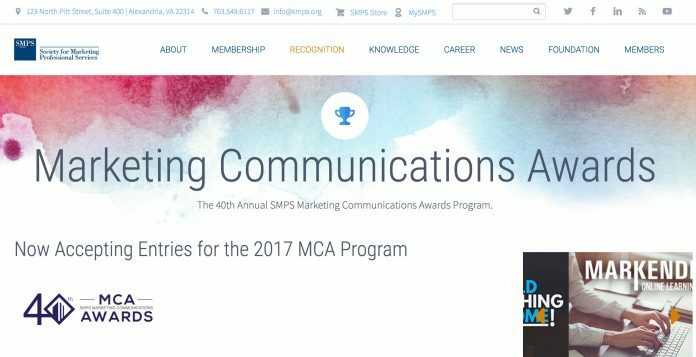 The MCA program is the longest-standing, most prestigious awards program recognizing excellence in marketing communications by professional services firms in the design and building industry, SMPS says in a news release. The discounted entry deadline is March 27. Final entry deadline (must be delivered to SMPS Headquarters) is April 3. SMPS members along with nonmembers working in the AEC industries are eligible to enter. Each year, this competitive awards program receives entries from around the globe. Firms can select from among 20 categories in which to enter their work, ranging from advertising, annual report, and corporate identity, to social media, and website. There is no limit to the number of categories a firm can enter. Many categories are open to both print and digital projects. Entries will be evaluated during the in-person judging event on May 6 in Southfield, MI, by more than 60 jurors from across the U.S. and Canada. Jurors will include professional services marketers and business developers, communications and public relations professionals, graphic designers, architects, engineers, contractors, and media. Evaluations consist of a numerical scoring system based on five criteria to assess each entry’s effectiveness and return on investment, in addition to quality, message, and design. Dana Galvin Lancour, director of communications with Barton Malow, and Adam Kilbourne, director of marketing with Tec Inc. Engineering & Design, are serving as co-chairs for the 2017 competition. Visit www.smps.org/mca for detailed competition information, including categories and submittal requirements, comprehensive FAQs, deadlines and fees, along with a link to the online entry form. In addition, you can view the MCA online gallery for examples of our 2016 winning entries. Award winners will be announced and honored on July 13, as part of the Evening of Excellence during Build Business, the SMPS annual conference (www.buildbusiness.org), in Indianapolis, IN. Winning entries will be on display throughout the conference. Building industry editors and association leaders will be invited to select the Best of Show recipient from among the first-place-winning entries. Award winners will be announced in the online MCA gallery and via press releases sent to national industry publications. Note: I’ll most likely be one of the judges of the MCA Awards finalists at Build Business in Indianapolis.